Plans for ten new classrooms at Steyning Grammar School have been submitted to the county council. The schools wants permission to create the state-of-the-art classrooms to replace its temporary hutted classrooms on its Shooting Field site. The new building, which would be single storey with a flat roof, would be accessed off the main entrance lobby and as well as the ten classrooms would include a hub room, storage space, two toilets and circulation space. A planning application for the works has been submitted by Eco Modular Buildings on behalf of the Department for Education and West Sussex County Council. The proposed teaching block will replace ten temporary teaching blocks situations in various locations around the school site. These blocks are in a poor state of repair and are no longer suitable for use and are set to be demolished. The new building will be located in the north-eastern corner of the site and ‘will provide much improved on-site teaching facilities for pupils and staff’. It will be built using high-quality red brick slip which ‘reflects the existing material palette of the school’. The application concludes: “The current and continually deteriorating condition of the existing temporary buildings could mean that in the near future these buildings could become unusable thus reducing the capacity of the school and the provision of school places within the district. In his consultation response David Barling, county councillor for Bramber Castle, said: “As local member I have been fully involved from the start. An extra teaching and classroom block is desperately needed. It is well sited. 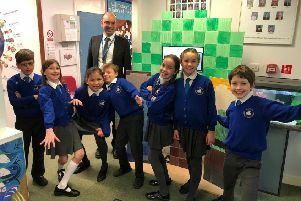 Back in March Nick Wergan, headteacher at Steyning Grammar, said: “Our vision for learning at Steyning Grammar is an exciting one, combining academic excellence with the development of the learning character our students need to flourish as successful and happy young adults. To comment on the application visit www.westsussex.gov.uk/planning using code WSCC/033/19.